I was barely 10 years old when all the girls in our grade five class were grouped together in one class with four female teachers. I personally thought it was quite exciting. They were here to teach us about menstruation. By then I had heard about menstruation/periods but really didn’t understand it properly. At that time, we knew that at a certain older age, women BLED FOREVER. The teachers were friendly I have to admit, but what they were teaching was not the least bit friendly to my ears. It brought me chills and I knew I didn’t want this burden of menstruation on me. They taught us that menstruation was good and natural since once we had it,we could now have babies… even more chills. Babies again? I looked around and my other classmates seemed excited. I wasn’t; I was scared for my life! I said a short prayer. After some time of being taught the basic diagrams, facts and all, it was time for questions. I had questions .many questions, but my most important question was: can we stop it before it starts? Like how important is this scary bleeding? I asked this question. I receivedthe response that as a woman you should be able to bear children and by having periods, it prepares you for that. Again, my mind went into overdrive and asked, what if I don’t want children? I was told every woman at the right age, when married, should have children. I was 10 years old and I knew this for sure; this wasn’t for me and this disaster called periods would ruin my life. I had more questions…define bleeding, is it a drop or? No, it is continuous bleeding for 3 to 4 days and for some it goes on for even 7 days. Does this also include the time when we are bathing and pooping? Yes. Horror horror right there. I felt my stomach churn and said a longer prayer. Lord, please could you please forget me as you give other people this periods? I couldn’t have known by then but I felt that periods would NOT be a joyous moment for me as the teachers told us it would be. I could see that around me, other girls were excited about having their periods, maybe they were faking it, but I was cold and blank-faced. Even after that session, girls were all excited and talking about it whereas I just wanted to go home and sulk under my blankets. 3 years later, I did get home and sulked under my blankets. The Lord had not heard my prayers, my periods were here and I HATED THEM. They came while I was in school, during a break session and my close friends back then were excited for me. I was the last of the friends circle to get my periods and they had sanitary pads ready as well. They were SO EXCITED… BUT I WAS ANGRY AND DISAPPOINTED. They told me of their smooth experiences with 3-day periods, drop-like flows, all these awesome bodily changes. A quad billion years later, I’ve still never had this smooth experience and I’ve never experienced 3-day drop-like periods. from here to high heaven. My first period was a continuous waterfall of a crazy 8 days. I was in so much pain and anguish, that no one could understand what I was going through. Everyone told me that the first period might be heavy and cause a little pain. By the fourth period, Mrs Smooth and Flawless would be with me, or so they said. By the sixth month, I was still rolling on the floor and cringing in pain. I needed to die at that point. I was taken to several doctors and I was told the same story/nonsense, that this is normal, women experience pain, you need to toughen up, here take this Brufen and get used to it. By that point, I came to understand that this was going to be a very lonely battle. I got a little depressed. At that time, we didn’t have any sanitary towels with wings, so you can just imagine the discomfort of having a waterfall passing through you as you try to sit and concentrate in class in a very light sky-blue dress on the second front row bench. No one understood then, but my grades started declining. I was one of the brighter kids in class but now during this horror period, I hardly concentrated in class; waterfall may penetrate, pain might have potentially killed me, I took enough Brufen (Ibuprofen) to reduce this pain but also woke up to ulcers while at it. I lived through my little horror story alone; my closest friends didn’t get it, the school nurse didn’t get it, the female teachers didn’t get it, my mother believed me but still had never experienced this kind of pain so she still didn’t get it and worst of all, the DOCTORS DISMISSED MY COMPLAINTS. My second year of menstruation was not any better. I was now in high school and this was a boarding school and I couldn’t run home after school. I had to ‘bear’ with it. I ran out of painkillers real quick. The school nurse and matron at first assumed that I was faking it but with time, they got a little considerate as the periods got a little crazier. It now became a cycle. Every time I was on my period, I had to miss classes as I had to go lay at the nurses’ clinic because the pain was that extreme. The flow was unforgiving. Most of my school shopping consisted of packets and packets and packets of heavy sanitary pads. STILL, IT WAS ASSUMED THAT THIS WAS NORMAL. During holidays, we visited more doctors followed by the same old script where I WAS DISMISSED. I was mentally, emotionally, and physically drained. All these years from when the horror started to when I was cleared, I still wasn’t convinced how important menstruation was. For me, menstruation meant hell. Even mentioning the word made my pelvic psychologically ache. Now the icing on the cake for me was this was something I battled all by myself, alone. This was more or less a taboo topic to talk about and those who heard didn’t believe me, and so if someone else was going through my hell, they too would have cried and struggled alone. The mental exhaustion of this is beyond limits, no matter how strong you are. You hate yourself and if you are religious, you hate God, you are forever angry and on the edge, and become more and more of a loner because by now, you are no longer told to bear the pain but you are told to stop exaggerating imaginary pain. For 15 years, I battled this imaginary and growing pain alone. Doctor after doctor, year in and year out. I missed out on so much. I was angry, confused, and alone. I hated myself so much for the pain that was no longer just during my period but by now, it began to live with me every single day. Everything ached. I was a mess physically, emotionally and mentally. I needed to know I wasn’t crazy. Now I know. 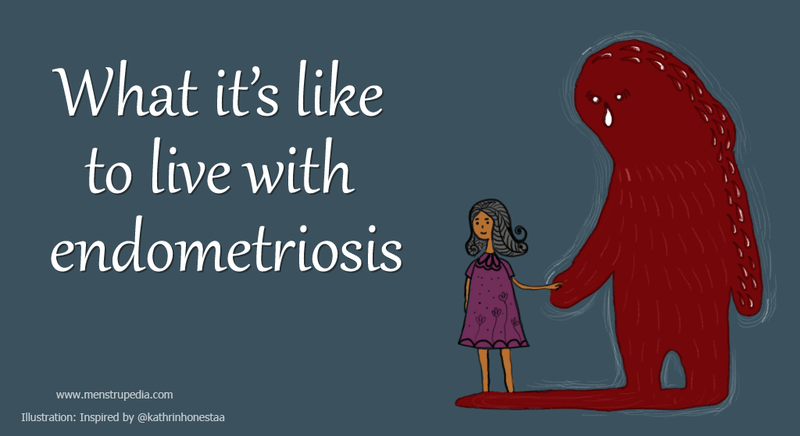 My 15-year “imaginary” and dismissed horror had a name: endometriosis. I wasn’t crazy. Maybe deep down, from the first lesson I felt it, maybe. The teachers just taught us what was textbook basics but I need this to NOT be the norm. Period pain is not normal, boys and girls, men and women,heavy periods are not normal . Periods can bring about disorders and chronic invisible illnesses with them. They are not a blessing to every girl; some live through painful horrors. 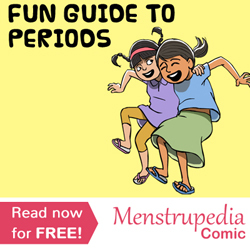 When educating both boys and girls about menstruation, please don’t just show them the rose-coloured glasses view. Don’t let another girl live this nightmare alone. The single voices of the MILLIONS of women who suffer from any and all period/hormonal related illnesses, I want you to know that YOU ARE NOT ALONE; THE AGONY IS NOT IMAGINARY.